Greg and Yocasta’s relationship first started long distance, they talked for many hours on the phone before first meeting, and they had their first date after Greg drove 6 hours to celebrate her birthday in December. The couple has celebrated monthly milestones ever since, it’s their way of saying, “How truly lucky we are to have found each other”. With her family’s blessing, Greg proposed on 7/18/17. Once working with Destify and their agent Ann, they were luckily able to secure 7/17/18 as their wedding date. Yocasta knew she wanted a wedding in the Dominican Republic, it’s where her mother’s side of the family was originally from. 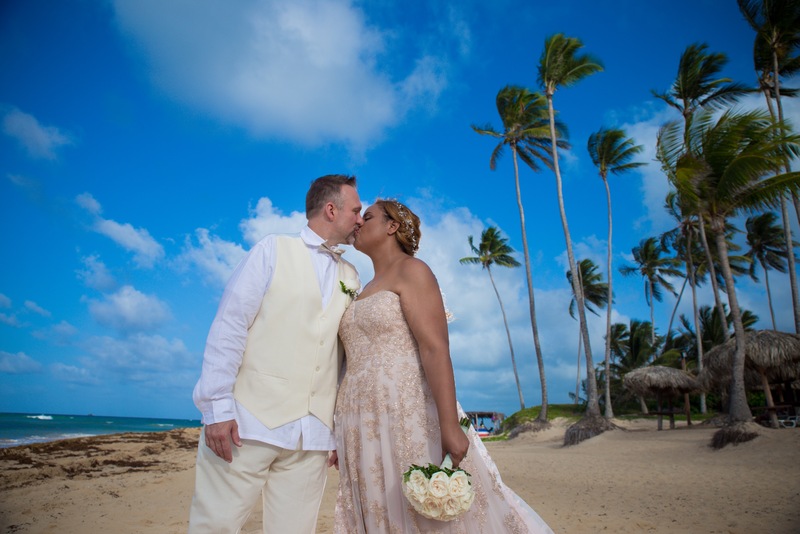 It wasn’t easy getting the date at first, in fact, it happened after several different dates and scenarios happened before, but finally, the date opened at the beautiful Dreams Punta Cana. The couple both agree the wedding department was very accommodating. There were numerous planning changes to the wedding itself, but Yocasta said, “They always made sure my vision for the wedding was all that mattered”. The couple also planned for some special songs to be played as they walked down the aisle for their ceremony. Once at Dreams Punta Cana, the couple loved how much quality time they got with loved ones. Many of the guests were able to participate in a snorkeling excursion, which included many firsts, from petting a shark to holding a stingray. Everyone loved the resort. The couple said, “The pool was like nothing anyone had seen, hundreds of feet long with many different branches”. On the day of the ceremony, the couple split up to get ready. Yocasta met with her girls to prepare and even partook in some pre-pampering treatments at the spa. For the beach ceremony, Greg walked down the aisle with his best friend Jerry to Luther Vandross’ iconic “Here and now” and the girls walked down the aisle to Whitney Houston’s “I look to you”. After, the couple took pictures with family and friends and held a reception where everyone got to celebrate and enjoy delicious food. The couple encourages future couples to stick to your vision. Also, it may sound small, but Greg recommends making sure your wedding attire fits perfectly before leaving since you’ll be in another country where it’s much harder to make any last-minute changes. Being able to spend so many meals with family and friends during the week made the entire experience all the more special.